The first global war of the twentieth century was a sad yet in some ways exciting time for women. Their brothers, husbands, and sons rushed off to battle for personal glory or the honor of their "king and country," leaving them to take up men's work. Those in Belgium, Serbia, and other invaded countries were in harm's way. In the shadow of a war that proved to be long and bloody, some strong women felt compelled to take up causes or even join the men in battle. Kathryn J. Atwood has written about them in Women Heroes of World War I: 16 Remarkable Resisters, Soldiers, Spies, and Medics. Atwood's new book is a logical and useful prequel to her book Women Heroes of World War II. In both books she sets the historical stage and profiles women who acted bravely for causes in which they believed. A few of the women, such as mystery writer Mary Roberts Rinehart, were famous in their time, and others, such as Emilienne Moreau, became national heroines, but most are names current readers will not recognize. Atwood thinks they should. With interesting sidebars explaining important details in the stories, such as the use of poison gases in warfare or the popularity of the song "Over There," and with a generous use of photographs, Women Heroes of World War I is a good introduction to the war that started 100 years ago for readers of any age. It is also a helpful addition to the literature of women's studies. Look for it to be popular in school and public libraries. Atwood, Kathryn J. 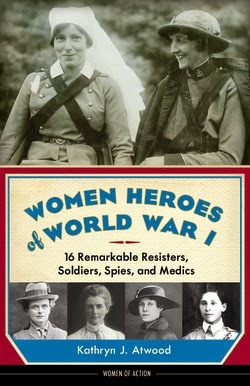 Women Heroes of World War I: 16 Remarkable Resisters, Soldiers, Spies, and Medics. Chicago Review Press, June 2014. 246p. ISBN 9781613746868.